One thing to be aware of, is that there are some poor pressing out there that may still sound bad no matter what system they are played on. No amount of tracking can fix bad product, unfortunately. Though I always used a protractor with my previous Clearaudio ‘table (the Clearaudio protractor, which is excellent), it does not work on the tonearm on my SL-1200G. For this ‘table I’ve only ever used the Technics white plastic guage. Is there something else you use for 1200s? I use the Shure protractor for Baerwald alignment. The one which came with the M 97xE. Interesting, because that would be different from the Technics 1200 alignment, right? Is the cartridge straight in the headshell when you do that? What differences do you find compared with the Technics alignment? Yes, it is straight. I find a little bit better tracking on the inner grooves and consistent sound across the record on my Technics. The Stevenson is still recommended equally. Both get you where you need to go. Just read the original post by our host. Garrard turntables circa 1970-1972 ... ick ... I used lawn mowing money to get my first "big" turntable. Don't recall the exact model number but I believe the number "30" featured. I don't recall the cart either but one of those shures you got for a penny when you bought the turntable. But I do remember one thing like it was just yesterday: IGD or inner groove distortion. I heard it immediately and nothing could be done to stop it with that player. I tried twisting the rubber counterweight - while adjusting for accurate tracking force. Morr tracking force. Less tracking force. Nothing worked. Whatever. Less than a year later I traded in for credit toward a Pioneer pl-12d. Just like out host! I loved that table and so did my friends. Several bought them too. I played it to death. The motor burned out about 1980. I also had a wonderful Grace F9d cart on it for the last 5 years. I had that until 4-5 years ago when I got back onto vinyl after fooling around with hi-res digital formats. That table is the Well Tempered Amadeus with Grado Refetence Master. This thing is insanely great. My friend down the street has a Transrotor- a magnet drive job - and it's way more insane. But both tables sound great. Something to mention about the current Well Tempered line- it's impossible to screw up cart installation. The head shell angle is preordained. You just make sure the golf ball is roughly centered in the cup. And take care to set VTA that is favorable for your cart. This lack of choice upsets more than a few audiophiles but I find it a refreshing approach. The results speak for themselves. Btw, the tonearm attaches to a golf ball that is suspended by monofilament line and rests in a cup filled with silicone. I'm not making this up. Google it. I'm really liking the sound from my old Shure M93 cart. Where did this model fall in Shure's line, and is it generally considered to be adequate for casual listening applications? Bottom line, there is NOTHING WORSE FOR YOUR RECORDS THAN A CHEAP DIAMOND ELLIPTICAL NEEDLE. Totally death for your grooves. Spend more and get a good Elliptical!! Can you recommend a few good styluses on the market right now, from the least expensive to a few midrange and even a few expensive ones? It may help those who are getting into records. You don't have to spend a fortune. I have an Uturn Orbit and the cart it came with, the Orotfon Om5e, not an expensive cart. The combo of these two track like a champ. I was surprised, because after suffering with IGD on my Technics SL-1200 and an Ortofon OM-10, I thought I would not be impressed by the Om5e, but I am. As much as I tried to adjust everything I could on the Technichs/OM10, I could never get rid of IGD. Even though the OM5e is slightly cheaper, it is a dream on the Unturn, without ever having to fiddle with it; it worked great out of the box. I guess some combos work better than others. My SL-1200 currently has a Nagoaka MP-110 and it took care of all the problems I had with the OM10. NO IGD on either turntable. I'm currently using the ATN100/E, upgraded from the stock green cart (AT95) last year. I like it, but it's been getting a good amount of use and sounds like the stylus now needs replaced. How would you say this Ortofon stacks up to the 100/E? Posed this question recently in this thread, and a poster stated that the Ortofon doesn't offer as much "bang for your buck in terms of stylus profile" compared to the AT carts. Won't find a better cartridge at 5 times the price?? You sure can. A Grado Platinum, or a Denon DL-103, for example, each well under $500. Still ...a great cartridge for us that are not complete audiophiles. I find it to be quite amazingly good, though I can't say comparison wise. I only know the upgrade to Red was like night and day. A sweet cartridge for $100. You can even find a far, far superior Ortofon for about $350. The OM 40, which features an advanced FG70 stylus, is superior to the 2M Black with its (relatively) inferior Shibata for about half the price. The OM 20 is also better than the 2M Red for only $189. McLover and Heckto35 like this. OK. I give in. Still, the Red is a very good cartridge for $100--can I say it is hard to find a better at that price? Why do you say the "relatively inferior Shibata"? I'm not saying it isn't or it is. I'm just wondering why you say so. The Shibata has its own sound signature. Some like it. Some don't. But it tracks like amazingly well. ORTOFON RED: A few reviews, not if you are an audiophile freak, but for a great cartridge upgrade on a budget. ANYWAY, I'M JUST SAYING IT WAS A MASSIVE UPGRADE TO THE CARTRIDGE THAT CAME WITH THE TT. Of course you may not think much of my TT either, but my Audio Technica LP120 does a perfectly fine job with my powerful vintage Yamaha amp/receiver...out of which I can get all the subtle nuanced bass and treble adjustments I desire. The Ortophon Company was founded by Danish engineers almost a hundred years ago as the Electrical Phono Film Company, with the goal of expanding the world of high-quality audio recording and developing the world’s first synchronized sound film systems. After a century of development and innovation, their HiFi products remain some of the most sought after on the market. The 2M series is designed to give listeners faithful reproduction of their music regardless of their budget. The 2M red gives you an exceptionally warm and balanced tone with a full mid-range. The improved engine gives it a higher output than other models in its price range and its sensitivity makes it especially great for vocal music of all genres. Though the sound is your main concern, this cartridge is also easy to align and installs simply and snugly on standard tonearms. It’s a versatile cartridge, good all-purpose use and giving you an open, spacious sound that will fill your listening room. It’s among the best phono cartridge not only $200 but under $100 as well. This cartridge captures the texture and nuance of your records with the same accuracy as cartridges that cost two to three times as much, making it perhaps the best-valued replacement phono cartridge on the market. It was developed in collaboration with the Danish company Moller Jensen and inspired by the clean precision of the diamond. Based on the photos that pop up in the Twitter feed, it is clear that many of you use members of the Pro-Ject Debut, Essential and Genie family as your turntables and this is a no bad thing. These brilliantly effective decks are capable of fine performance and many of them are rather handsome things as well. As a rule of thumb almost all of these decks come fitted with the Ortofon OM5 cartridge which is a very fine performer- with one useful benefit. 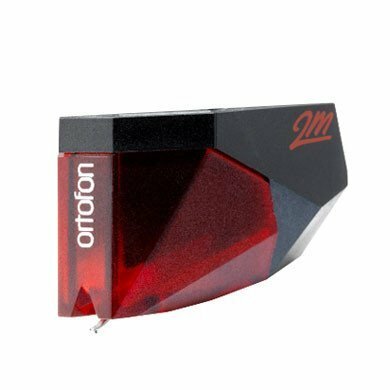 Ortofon makes a truly biblical range of turntable cartridges and if you have a turntable with an OM5 type cartridge, you can effectively 'straight swap' it for the 2M family as a quick and simple upgrade. If the arm works with one, it is almost certain to work with the other. And the benefits to doing so are considerable. The 2M range is a clean sheet design intended to deliver the highest performance possible at a sensible price. The faceted design is intended to reduce resonances and they use slit pole pins derived from moving coil cartridges to keep stray currents at bay. Looks at the specs of the Shibata vs. the FG70. The Shibata is either 6x50 uM or 6x75 uM. Fritz Gyger FG70 is 5x70uM. Ortofon also uses a 5x100 uM Fritz Gyger on their high-end cartridges (longer contact patch, but same minor radius). The smaller side radius means better groove tracing and less distortion, particularly on inner grooves. Micro ridge, Micro Line and the like have an even smaller side radius, though 5uM should be sufficient to trace everything. The Shibata is still quite good, just not as good as some of the later designs. You can even find a far, far superior Ortofon for about $350. The OM 40, which features an advanced FG70 stylus, is superior to the 2M Black with its (relatively) inferior Shibata for about half the price. From what I can gather in very limited experience of just people's transfers posted online, doesn't the OM 40 stylus actually sound better in the 2m Bronze/Black body, with a seemingly flatter response? Obviously that would cost even more if you don't already have a Bronze or Black, though hearing (in different persons' setups) a Super OM 40 cartridge struck me as more pushed up in parts of the upper two octaves vs the OM 40 stylus on the Black cartridge. I'd like to hear a more direct comparison, with the same records, electronics/setup, etc., with just the cartridge itself being different. You don’t need to use the “Super.” KAB has the original OM body. Not sure if that makes a difference. I use a 40 stylus in a KAB Pro S on my Technics and it sounds very nice, when the capacitance is set properly.